“Looking through archival photos, they were already covered over by the 1950s,” says Vattay. “It was likely to block out the light and the noise.” Indeed four floors of windows, beautiful as they may be, can present a real challenge to a music hall. Not only can light drastically alter the desired visual effect of a particular performance, the thin stained glass windows allow outside sound to permeate inside. When Massey opened in 1894, the quaint clip clop of horse and carriage may initially have been tolerable, but as they gave way to the dull roar of automobiles, and the surrounding city grew denser and nosier, the sound bleed became too much. In 1911 the installation of exterior fire escapes meant some of the windows were altered or removed entirely, and in 1933 more were removed where Juliet balconies along the Shuter St. façade are now, part of a renovation that allowed smokers access to a balcony that once hung above the front doors. Describing the windows in a detailed 1993 article, “The Hidden Glass Treasures of Massey Hall,” York University art historian and Canadian stained glass expert Shirley Ann Brown described some of the windows as art nouveau in style, while twelve on the main level of the auditorium “include life-sized portraits of famous composers — Bach, Beethoven, Mozart, Mendelssohn, Rossini, Chopin, Wagner, Gounod, Schubert, Weber, Handel, and Haydn — surrounded by art nouveau frames and bands. Eight of these survive in place, sandwiched between their protective boards. Four others, which were removed long ago to make way for the emergency exits, survive in partial states.” Some of the windows under the roofline were originally backlit by gas lamps as well. Brown also found evidence that suggests the windows were designed by the Cooks Brothers of Cleveland (where the Masseys had briefly lived) but likely manufactured by Faircloth Brothers of Toronto. 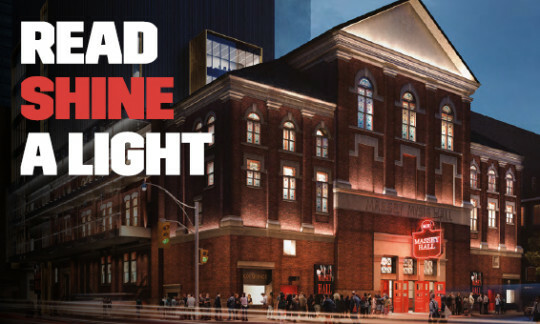 Vattay points out that the bricks came from the Don Valley Brickworks, so Massey Hall is very much a made-in-Toronto building — with international connection and inspiration. It all sounds very much a contemporary Toronto story.Vattay explains that, even though seemingly protected behind the wood, considerable damage occurred to the windows over the years. Moisture can build in the enclosed spaces, and birds made nests there as well. “Bird guano is deadly for any material,” she says. “We retained a stained glass conservator, and after a full assessment determined the windows should be removed right away.” That removal and rehabilitation process is a delicate enterprise — and an expensive one. John Wilcox was one of the experts charged with overseeing that process. 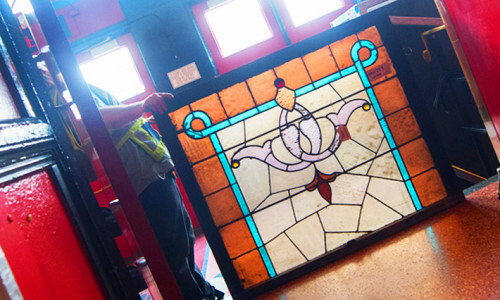 He and his Vitreous Glassworks company have been working in stained glass glazing for thirty years, including conservation work on other Massey family projects around Toronto including their mausoleum in Mt. Pleasant cemetery, and Hart Massey’s home, now the Keg Mansion, on Jarvis. At Massey Hall the windows were first gently removed, documented, tagged and labelled. Transported as gently as possible, they are nevertheless protected in specially designed crates that could withstand quite a bashing. Those crates are also ventilated, to prevent moisture or humidity from causing rot or algae blooms. Once at the shop and removed from the crates, each window is extracted from its wooden sash, placed on a bench and an exact pattern of the window is made with carbon paper as the lead between the glass is raised. Then they get a gentle sponge bath so no glass paint is rubbed off. Wilcox says medieval European stained glass windows have problems with decaying glass but in North America the glass is strong, though fading paint can be an issue. Lead that is decayed, thin, or fatigued will be cut away and replaced, and each piece of glass along with the putty will be cleaned and placed back on the paper pattern. Soft metal will be placed around each piece and soldered before the panel is flipped over and the same is done to the other side. The process, says Wilcox, hasn’t changed much in 1,000 years. 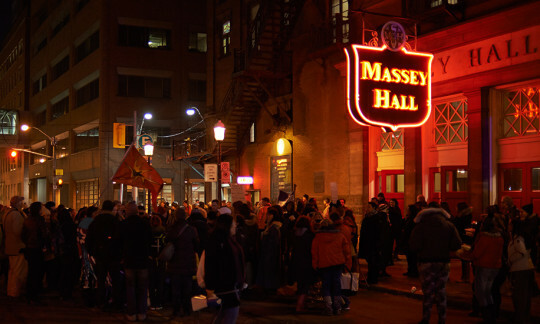 A challenge at Massey Hall will be finding matching glass for the windows that were removed and lost. Once reinstalled, the windows will have a renewed, long life. The acoustician and lighting designer on the restoration team will determine an innovative method of covering the windows for evening performances. The result of this thoughtful process, says Vattay, will allow the stained glass and the renowned performance space to coexist, and Toronto to enjoy an 1894 public treasure that’s been hidden from view for a century.